Timber quality describes all the wood characteristics and properties that affect the value recovery chain and the service-ability of end products. In the context of timber production the quality of timber is a major driver for the price of the final product and the income of forest owners. The higher the quality of timber, the easier it is to achieve a ‘good’ price. For construction purposes the attributes dimension, stiffness and strength or dimension stability are most important. Wood properties determinate the quality of timber as well. Here the number and size of knots, the grain angle or attributes like the density, relation between juvenile and mature wood as well as compression wood have to be considered. 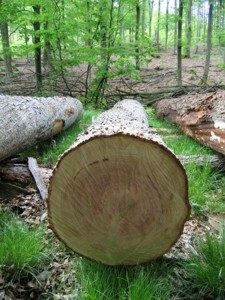 It is known that silvicultural practices, site factors and the genetic quality of the planting stock can affect tree growth patterns and therefore timber quality as well. Especially by changing the environment of the tree’s crown the wood quality can be influenced by silvicultural measures (e.g. tending, thinning, pruning, initial spacing of trees, mixture of trees). Therefore it can be assumed that the variability in quality of tree stems increases with neighbourhood tree species diversity.